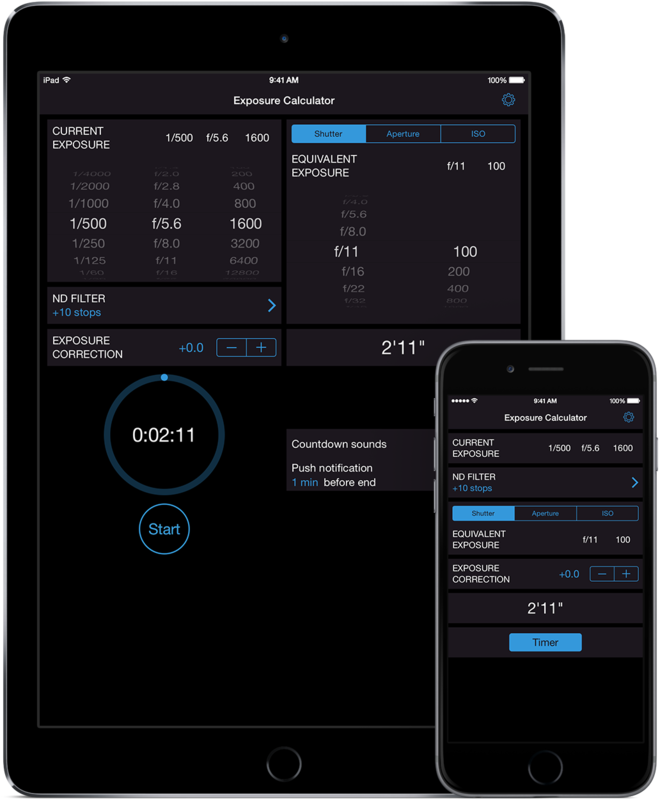 Exposure Calculator is an iOS application for photographers to convert and calculate different exposure settings. Exposure Calculator helps you to find the correct settings for your longtime exposures. Exposure Calculator helps you to find the correct settings when using ND filters. No matter which parameters you want to use: Exposure Calculator calculates the remaining target value for you. In order to not be frustrated when discovering after a 30 minutes exposure that your photo doesn't look as you want it to be, start by taking a test shot with a high ISO value and open aperture. This is just to make sure that the exposure settings are correct. When your test shot looks good, enter the settings (shutter speed, aperture and ISO) in the Current Exposure area of Exposure Calculator. Now go to Equivalent Exposure and choose your desired settings for aperture and ISO. Exposure Calculator calculates the correct shutter speed value. The screenshot shows a test shot which was taken at ISO 6400, aperture f/2.8 and shutter speed of 1/8s. The final shot should be taken with ISO 100 and aperture f/8. After setting up these parameters, Exposure Calculator calculates the required shutter speed to 1 minute and 4 seconds. When using ND filters with high extension factors it might be impossible for your camera to take exposure measurements. A test shot without ND filter helps to determine the correct exposure settings. These settings are entered in the Current Exposure area of Exposure Calculator. Now choose the desired ND filter and change the other exposure parameters to fit your needs for the final shot. Exposure Calculator calculates the required shutter speed. The screenshot shows the parameters for a test shot with ISO 1600, aperture f/5.6 and a shutter speed of 1/500s. The final shot should be taken with a ND 3.0 filter (extension factor 1000x) at ISO 100 and aperture f/11. Exposure Calculator calculates the required shutter speed with 2 minutes and 11 seconds. If your camera doesn't have a timer for longtime exposures, just use Exposure Calculator's built-in timer. On request, it plays countdown sounds when approaching the end, so you won't miss when to stop the exposure. For very long exposures you can be reminded by a push notification before the timer ends. This also works if Exposure Calculator is closed while the timer is running! You can configure Exposure Calculator to meet the capabilities of your camera. Choose which ND filters you own and let Exposure Calculator display only those to keep the list clear. Configure the color scheme to your personal taste.